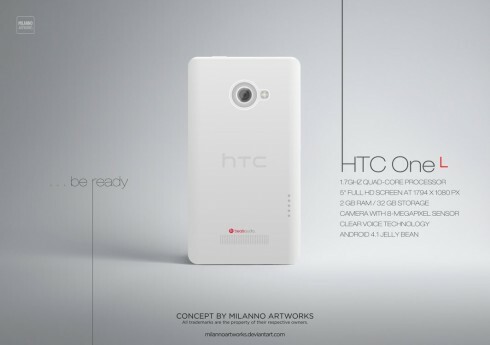 This is has got to be the first Android Jelly Bean HTC phone concept I’ve seen after Android 4.1 was launched. Meet the HTC One L, a design created by Milanno Artworks and a smartphone with a truly thin bezel, that would fit just at home in the One Series. In reality we’re all expecting a 5+ inch device from HTC, rumored as the HTC One XLL or the HTC One Note. 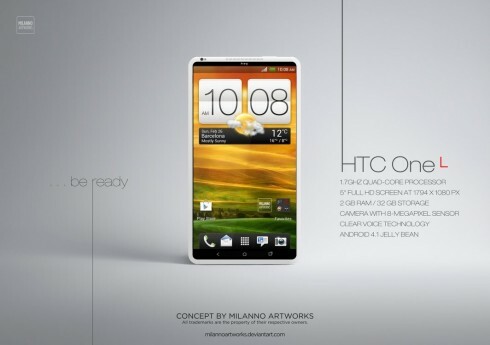 Or it could be called HTC One L, like this one and feature a 5 inch Full HD screen at 1794 x 1080 pixels in resolution. This HTC concept comes with a 1.7 GHz quad core processor, maybe the Snapdragon S4 quad core or maybe the Nvidia Tegra 3 with overclocking. Other features include 2 GB of RAM, 32GB of storage and an 8 megapixel camera at the back, very discretely integrated. Clear Voice technology is also on board and Android 4.1 Jelly Bean is the OS of choice, maybe with a new Sense on board, perhaps HTC Sense 4.1? The design of the back reminds me of the HTC One X, except that its elements have been moved around a bit. Frankly, I fancy this model more than the Galaxy Note II… Do you?